The air was so cool tonight and the leaves were so crunchy as we walked the dogs. Everyone is putting up their Halloween decorations around the neighborhood which makes us so grateful to live in a town that takes this season so seriously. We've said it before and we'll say it again, our town really does turn into Salem from the movie Hocus Pocus around this time of year and, honestly, it's pretty enchanting. Tonight Thomas' mom made homemade chicken noodle soup and we turned the fireplace on, something that's been happening quite frequently this week. We are cozied up on the couch watching Will & Grace and feeling pretty thankful all the things tonight: fall, October, chicken noodle soup, moms. We hope your Thursday night was alright, too. Good night friends :). 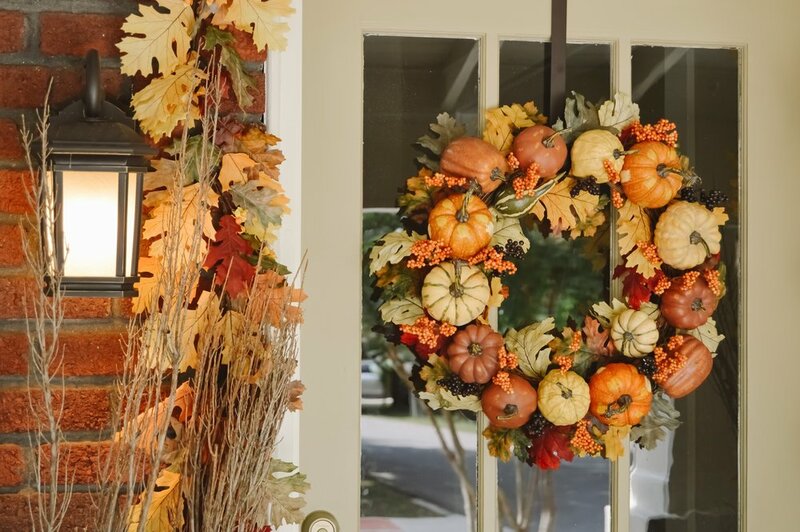 It's not secret that fall is our favorite season. We've said it on here before and you will hear us saying it again (this is your official warning). It may be 92 degrees here in Tennessee but that doesn't stop us from plugging in pumpkin wallflowers and listening to the You've Got Mail soundtrack on repeat. So, we started adding a little more stuff around the house here and there and actually plan on giving y'all a fall house tour in the next couple of weeks after we post some collaborations we've been working on. 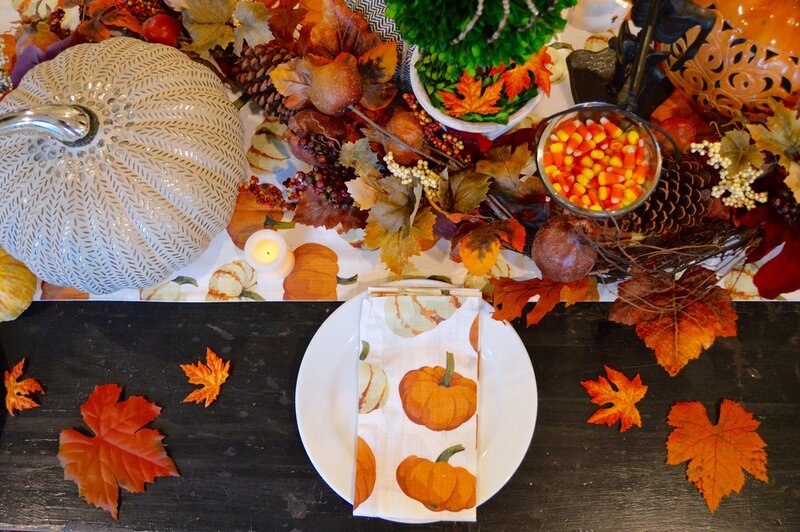 Our favorite is the jack-o-lantern pillow. It's just as comfy as it looks, too! We also added some faux pumpkins to the mantle as well as some branches from our back yard. Again, we plan on giving a full on tour here pretty soon, but we thought we would share this sneak peak for starters. We hope y'all have a good weekend! Are you as excited as we are for the season 7 (!!!) premiere of American Horror Story? We've been watching it since 2012 and it's one of our favorite traditions to kick off the fall season. So, because of the premiere, we naturally had to break out the fall pillows and throw. And a little wine and popcorn never hurt anyone either #amirite? 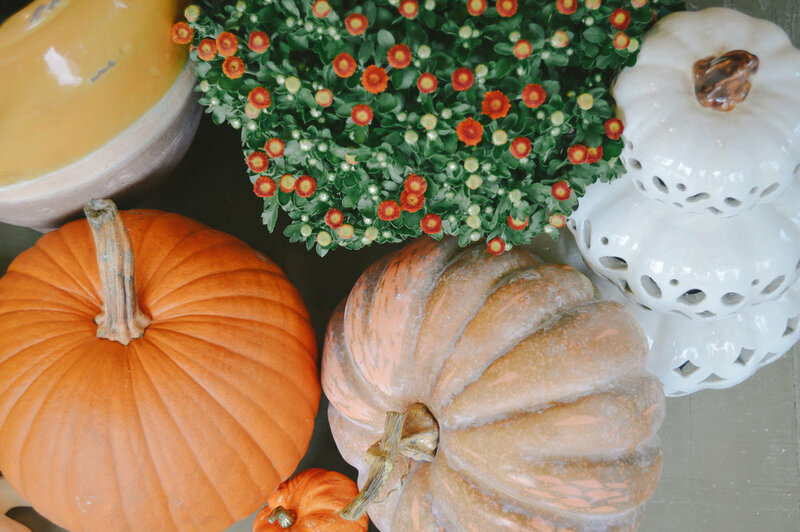 We have a couple of other fall traditions that we are excited to share with y'all in the next month, including what movies we watch, one pumpkin treat we can't live without, and a fun collaboration on how to decorate for this season. Can you tell it's our favorite yet?